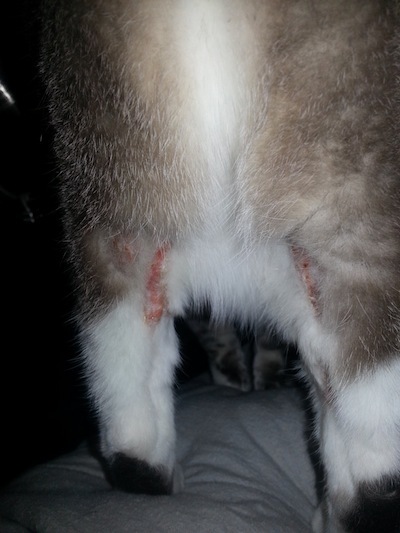 Bald spots on cat's legs. I moved from Los Angeles to St.Louis with my cat. For a few months now I've noticed my cat is obsessively licking her hind legs and now her front legs. She's licked the back legs to a point where they're red blood bruised. I've also noticed on occasion red mucus/blood in her stool. I've changed her litter brand, started giving her fish oil and try to spray the areas with wound spray but she's still going at it. I also started giving her half a small can of wet food to help with stool. Her dry food is Natural Balance Indoor Cat. I don't know what else to do. She's an indoor cat, very skiddish, hides under the bed most of the time. I've never taken her to vet. She will be 8 soon. I rescued her from an animal shelter at 3 years old (they estimated her age). She is fixed. I will try to send a picture so you can see her licking. There are a few things that can cause symptoms like this. The scabs on the legs are likely due to self trauma. But the question is what is causing her to do this. An allergy certainly is possible. It is often difficult to know what a cat is allergic too. It is unlikely to be the food. Fleas can do this, although the distribution of the lesions is not typical for a flea allergy. Some cats can do this as a result of "stress". It's often difficult to know what the cause of the stress is and most cats in which I see this actually lead pretty non stressful lives. There are some conditions such as immune conditions that can cause lesions like this too. This is something that is not likely to go away on its own. I would highly recommend a veterinary visit. The vet may decide to do some tests to rule out immune conditions like eosiophilic dermatitis or even fungal conditions like ringworm. There is a good chance that this will go away with steroids. These are safe to give to cats in the right dose. I do hope that things improve soon.